One of the most attractive attributes of Riverchase is the abundance of trees and wooded areas throughout the neighborhood. From pines to various hardwoods, this community is blanketed with a beautiful canopy, starting in the spring and lasting well into the fall. And with these trees comes a wide variety of wildlife that lives within them. Residents of Riverchase have reported sightings and taken pictures of foxes, deer, rabbits, as well as a wide variety of birds. 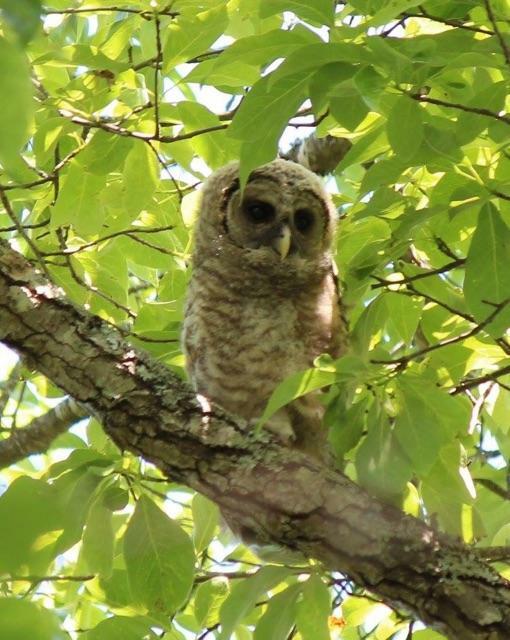 However lately, one of the more famous inhabitants of our trees has been the Barred Owl — one family in particular living in the woods between Oak Tree Road and Tulip Poplar Lane. This small group of Barred Owls is now known to be widely admired and documented by Dana Littleton and the members of the “Residents of Riverchase Facebook page”, where she often shares her pictures and videos. 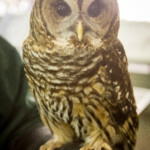 Named after the bars on its chest, the Barred Owl is said to be the most vocal of Eastern owls. Their usual call is a series of eight accented hoots ending in “oo-aw”, with a downward pitch at the end. The most common description of the call is “who cooks for you, who cooks for you all“, and are most often heard in the late afternoon hours. 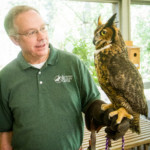 Their call, although distinct, can sometimes be confused with another Alabama native owl, the Great Horned Owl, which is without the “you all” at the end. Their call is a low-pitched but loud “ho-ho-hoo hoo hoo”; sometimes it is only four syllables instead of five. Another sound Barred Owls are known to make sounds more like a laugh. Those boisterous and “monkey-like” owl vocalizations beginning shortly after sunset are attributable to the Barred Owl’s mating rituals. Barred Owls usually begin laying eggs in December and with this laughing call, they are said to be redefining the boundaries of their large territories and reinforcing the bonds between mated pairs earlier in the fall, especially during mating season. And because Littleton and her family have spent so much time observing the owls in their back yard, they were able to document the arrival of a baby Barred Owl. They’ve even given the family nicknames — “Hoomama”, “Hoodaddy” and “Hoobabies”. “My oldest daughter’s room has a balcony which gives her the perfect viewing spot for the owls,” she explains. “She first spied Hoomama flying in and out of the tree in late winter/early spring 2016. We suspected there might be a nest so I am began researching all things barred owl. We quickly named and learned to spy Hoomama and Hoodaddy. We had almost given up hope because the owl activity changed without spying any babies. That all changed May 5, 2016 when I took the pups out first thing that morning. A baby owl was maybe 5 feet from me at eye level in a small tree.” The two owls that the Littleton family have come to love so much, became three with the birth of “Hoobaby”. “I would sit outside on the deck and watch the owls all day every day. Hoobaby would look into my eyes for hours. She was so precious,” said Littleton. Littleton recently hosted neighborhood wildlife photographer, Lindsay Donald at her house so he could get some closeup shots of the Riverchase Barred Owl family. Donald, also a resident of Riverchase, has a degree in zoology & animal behavior, and has always had an interest in observing and photographing animals. He asked Littleton if he could capture some photographs of these fascinating birds from her back deck. 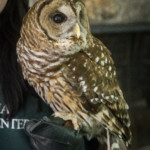 “Barred owls have the most distinctive owl calls, especially when they are communicating with each other. It is very cool that we have these amazing birds right here in Riverchase,” said Donald. 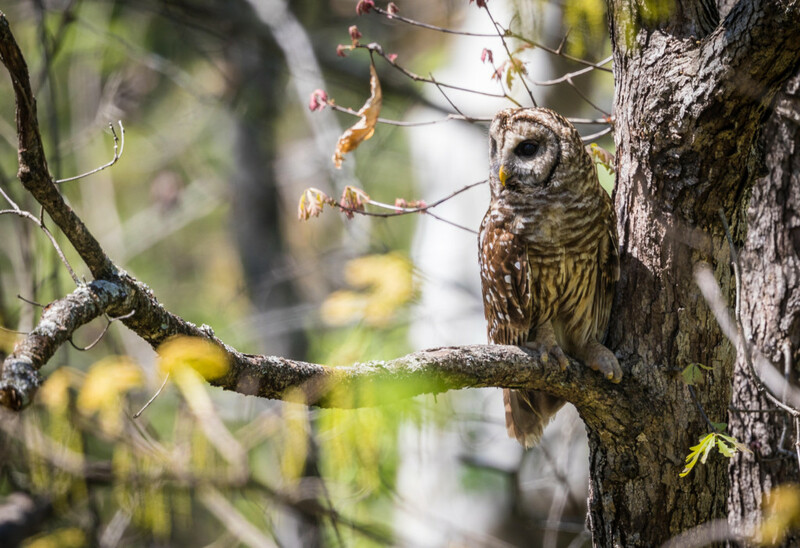 Small rodents and mammals up to the size of squirrels and rabbits, amphibians and some birds that live in these wooded areas provide prey for the Barred Owls. Their primary habitats are woodlands and a variety of wooded habitats in the southeastern United States, often nesting in tree cavities, and have even been known to venture into suburban areas with large trees, such as the wooded areas in Riverchase. “They also like to nest near water,” Adair added. “Rivers, streams, lakes and ponds often have families of Barred Owls living nearby. These types of waterways are another food source for them.” With the Cahaba nearby and the various lakes and creeks that can be found throughout Riverchase, it’s no wonder that these beautiful birds have made a home here. “Another unique characteristic of the Barred Owl,” Adair explains, “is that they are not completely nocturnal birds as most owls are, but they can be seen and heard throughout the day, but especially in the afternoon and evening hours.” Quite often, the family of owls in Riverchase can be heard calling to one another in the daylight hours, as well as in the evening. 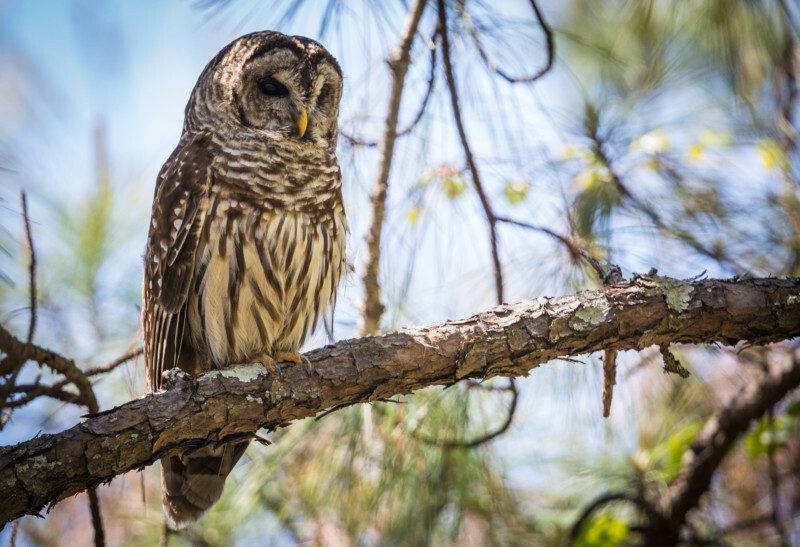 Aside from the Barred Owl, three other owls are native to Alabama — the Great Horned Owl, the Screech Owl and the Barn Owl. All four of these species, among many others, can be seen at the Alabama Wildlife Center, where they are rescued, rehabilitated, and often released back into the wild. 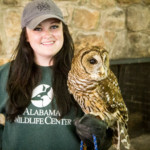 For more information on these and other birds of Alabama, visit the Wildlife Center in Oak Mountain, or visit them on the web at www.awrc.org.